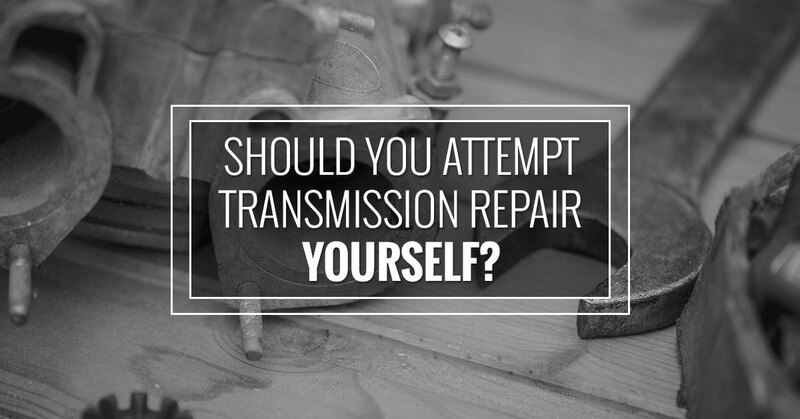 Should You Attempt Transmission Repair Yourself? With the advent of DIY tutorials, YouTube, and articles galore online, it might occur to you to attempt your transmission repair yourself if you run into problems. After all, if you can order the parts yourself and not pay anyone to do the labor, you could save a lot of money. However, transmission repair is not for the faint of heart. Your transmission is one of the most complex and delicate components of your whole vehicle, and if you don’t know what you’re doing, you may very well get yourself stuck. Here’s a fun quiz that can help you to diagnose whether you should attempt your transmission repair yourself. 1. Where is your transmission? a. I wouldn’t be able to tell my transmission from my engine if you had a gun to my head. b. I know exactly where it is, but I’ll have to follow some step-by-step instructions pretty closely to identify what I’m doing. c. I have a very good global grasp of where my transmission is and what I’ll expect to encounter when I start the repair. 2. Have you ever removed your transmission pan to clean debris out and change the filter? a. My transmission has a pan and a filter? b. I saw someone do it once, so I know about how much work it took, and I’m looking forward to something exponentially more difficult. c. I have done a regular transmission service of this type on multiple vehicles, and I can handle even the most complex ones. 3. How are your diagnosis skills for common transmission problems? a. I know my transmission is broken because my vehicle stopped running and someone said it was the transmission. b. I would probably start by checking whatever the engine code said, but if it wasn’t that, I’d be stumped. c. I am completely familiar with both the common and obscure causes of transmission failure, and I’d be confident in fixing it, no matter what it was. 4. Let’s say you have succeeded in removing and disassembling your transmission. Where do you go from there? a. Well…*scratches head*…I had better have a photographic memory for how to get all these pieces back together the way I took them apart. b. It’s a little intimidating, but I’d get most of the way and then just forge my way through with the help of forums and YouTube. c. You could throw the pieces in a box, mix them up, toss in a few decoy parts, and blindfold me, and I could still get it back together. If you answered (A) for most or all of these questions, do not under any circumstances attempt your transmission repair yourself. Give us a call and we’ll fix your transmission. If you answered (B) for most of all of these questions, you might be able to do it, but you might just as easily get stuck and have to tow your car to a shop after all. The best option is probably still to take it to a shop. If you answered (C) for most or all of these questions, congratulations! You could probably open your own transmission shop. But if this isn’t what you do on a regular basis, you’ll still want to weigh the time investment. Is it worth your time to do it? What’s the opportunity cost of what you can’t do with your time while you’re repairing that transmission? Everything you do with your time comes with a trade-off. If you’ve evaluated the trade-off and it’s not worth your while, bring your car down to MC’s Transmission, where we’ll treat your vehicle as if it was our own. We hope you’ve enjoyed this quiz. No matter what your transmission repair need in Northville and the surrounding community, MC’s Transmission is here to make sure your car gets the quality service it deserves. Schedule your appointment today.